On a day when big names like Martin Kaymer, Sergio Garcia and Paul Casey could managed just half a point between them and are now mathematically out of the running for the title, the Finca Cortesin course took no prisoners. The big winners on the day were the controversial American Ryder Cup player Anthony Kim and England’s Oliver Wilson, who won both their matches to take giant steps towards the last four. Race to Dubai leader Lee Westwood was crushed by six holes by a jet-legged Jeev Milkha Singh and is now in danger of falling in the group stages of a competition that now features a new, Champions Leage style round robin format with the top players in the four, four-man groups progressing to the last four. McIlroy’s fate is not quite in his own hands following Simon Dyson’s three hole win over Henrik Stenson in the other match in his group. And he will be determined not to repeat what happened on the seventh hole yesterday, where he three putted from eight feet to turn a potential two up lead into a lost hole that Cabrera confessed gave him the heart to turn the match around. 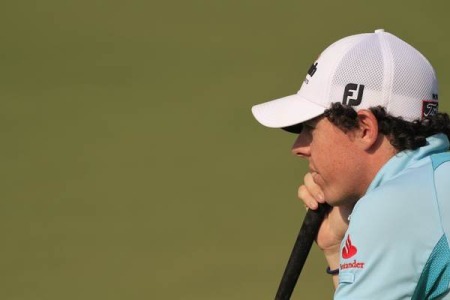 Having nudged one hole in front thanks to a 20 foot birdie putt at the par-three sixth, McIlroy misread his birdie chance at the seventh and then horseshoed out with a four-footer for par to lose the hole. 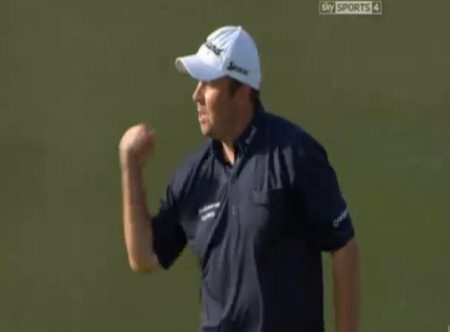 The match was back to all square and after that let off, the burly Argentinian bull had McIlroy on his horns and showed no mercy. McIlroy never got back in front in the match again as two-time major winner Cabrera (40) birdied the par five 11th to go one up, extended his lead with a winning par at the short 12th and then birdied the 13th from short range to go three up. McIlroy hit back by holing a six footer for a winning birdie at the 14th but Cabrera produced a stunning finish with birdies at the 16th, 17th and 18th giving him a five-hole win..
“Angel made five birdies on the back nine there and I gave myself a few chances but just didn’t quite get it done,” said a resigned McIlroy. “I putted well without anything really going in. I hit a lot of good putts and can’t really complain about that. “The seventh? It looked as if it would go right to left and I hit a really good putt on the right edge and it went right. On the way back it looked straight and it went left. I hit good putts and started the ball on the line I wanted but they didn’t go in. “The good thing is that I am still in it. I am not packing my bags and heading home. I have still got a chance, still got a bit of a lifeline. But I will need to play well tomorrow to try and get through to the semis. Cabrera paid tribute to his young opponent but had no doubt about the turning point in the match. “Rory didn’t have a great day but he’s a great player. He can win any major. The Masters? Of course. 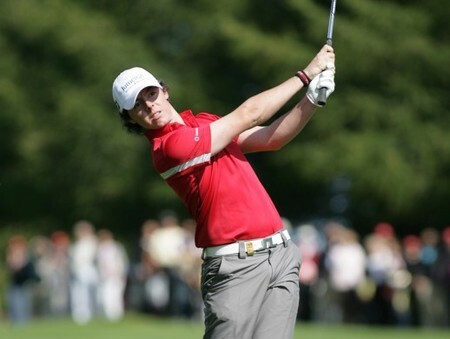 He can win the British Open, the US Open. All the tournaments he wants. And he’s a good kid.